Fire Prayer by Deborah Turrrell Atkinson: Synopsis and Online Purchase Options. Synopsis (from the publisher): Storm Kayama's old high school friend, Tanner Williams, wants a favor. He's asked her to come to Moloka'i to make sure his ex-wife is taking good care of his adolescent son, a newly diagnosed diabetic. In the meantime, Storm's law partner and lover, Ian Hamlin, is investigating the possibility that a Moloka'i kayaking company's negligence played a part in the disappearance of Brock Liu, the son of an O'ahu shipping magnate. It looks like a great excuse for Storm and Hamlin to get away from Honolulu for the weekend. 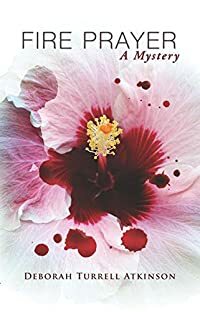 But Storm soon finds that Tanner has bigger problems than he let on, including his bitter wife Jenny Williams, a history of mental illness, and ties to a local protest group linked to an unsolved ten-year-old homicide. A few hours after Storm's visit to Jenny's home, twelve-year-old Luke Williams finds his mother dead on their living room floor. Luke calls the police, then he disappears. Storm believes Luke may have seen his mother's killer and is in grave danger from both the murderer and his fluctuating blood glucose levels. Her chase after Luke-and answers-leads through the dense rainforests, pristine beaches, and untamed wilds of Moloka'i. Are Brock Liu's disappearance and Jenny Williams' death linked to the old homicide?